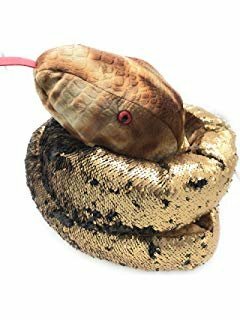 SEQUINED SNAKE PLUSH - This cute snake with its googly eyes and forked tongue is a reversible sequin on one side and a soft and cuddly plush on the other side. It's sparkle is sure to appeal to all ages! REVERSIBLE SEQUINS - Simply brush your hand across the sequins and you can change the look of the snake. Color changes from violet sequins to silver - create your own design! The underside is a pink, gray & black suede like feel snakeskin design fabric..
GREAT SENSORY TOY - This sequined snake provides hours of play and has both visual and tactile benefits. Petting the smooth side of the sequins and brushing the sequins to the reverse side color can be calming and mesmerizing. This plush snake can be a companion to you wherever you go! SUPER ROOM DECORATION - Aside from playing and petting this snake it will look fabulous on a bed!